We became the proud owners of 'Alnwick' (pronounced 'Annick') on 30th September 2005. Named after the historical county town of Northumbria, our boat was built between 1995 and 1998 by R W Davis & Son Ltd. of Saul Junction, Gloucestershire. Please click on this link to learn more about the town of Alnwick. Narrowboat 'Alnwick' was originally conceived as a special project by Phil Trotter, the Managing Director of R W Davis & Son Ltd, as a suitable craft to display his magnificent Kelvin K3 marine diesel engine that had been rescued from a Thames barge. After almost a year of meticulous restoration, the engine was fired up on Christmas Eve 1994 and work commenced on the hull the following month. The shape and design of 'Alnwick' was based on drawings and photographs of motor boats built in the 1930s by Yarwoods of Northwich but with a longer engine room and boatman's cabin reminiscent of steam powered narrowboats built during the early 20th Century. After being admired at various boat shows, 'Alnwick' became the prototype for the highly respected 'Northwich Trader' class of narrowboats - of which about 25 have been launched by R W Davis so far. Initially only the boatman's cabin was fully fitted out and the front 'extended cabin' was left unfinished apart from glazing and painting. In 2002, 'Alnwick' was purchased by Geoff & Wendy Towersey of Oxford who completed the outfit of the living accommodation to a very high standard. The Towersey family had lived and worked on narrowboats for more than twenty years and were able to apply their considerable practical experience to the interior design and choice of equipment. More pictures of 'Alnwick' may be found in our 'Gallery' and 'Archive' pages. Please click on this link for more information about the R W Davis 'Northwich Trader' class. There are several minor differences between 'Alnwick' and subsequent 'production' Northwich Traders which all help to make our boat a very individual vessel. One of the more obvious variations from R W Davis convention, is that 'Alnwick' was never allocated a build number - while under construction at the yard, she was always known simply as 'Phil's Boat'! Max. power output: 66 s.h.p at 750 r.p.m. Engine speed (cruising): 250 to 350 r.p.m. Propeller size: 24" X 24"
able to play sound files. The sound recordings were made in the engine room of 'Alnwick' on 7th December 2006 with the engine nicely warmed up and running in neutral. The slower speed of 140 rpm is basically 'tick-over' and will propel the boat along at about 2 mph; the faster speed of 300 rpm is normal canal and river cruising speed (when there is plenty of water under the hull) and will propel the boat along at about 4 mph. We rarely run the engine faster than 600 rpm which is quite sufficient for tidal waterways. The photograph shows our Kelvin K3, No. 26974, at the workshops of R W Davis & Son Ltd. on Christmas Eve 1994. As may be obvious from the can of 'Bradex' standing on the gearbox, some initial difficulty was experienced in getting the engine to start after its year long overhaul. When it did start the original Kelvin fuel filters leaked diesel all over the place which probably explains the tray placed beneath them - those original filter cans remain in-situ but are no longer used, having been bypassed long since by a more efficient remote fuel filter which does not leak and, therefore, makes starting very much easier! Other minor modifications that have been made include the fitting of a Lucas 'Thermostart' to the elbow on the inlet manifold - this is a simple device (originally designed for diesel tractors) that enables the engine to be started on diesel in all weather conditions. 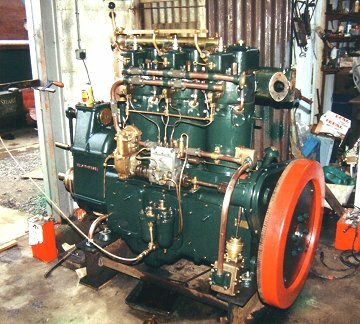 Phil Trotter rebuilt the engine to a very high standard and, as installed in 'Alnwick' it is rarely subjected to the loads and stresses that it was designed to endure, as a result, it has required very little attention other than routine servicing since 1994. The only serious problem to date being the failure of the enclosed camshaft on the C.A.V. BPE type in-line fuel injection pump - one of the few items on the engine that was not manufactured in Glasgow by the Bergius Kelvin Company! Please click on this link for more information about Kelvin K3 Marine Engines. Engine No. 26974 was supplied new in August 1954 and delivered by road to the long established ship yard of Richards Ironworks Ltd., at Lowestoft, to be fitted to the Thames sailing barge 'Dannebrog'. She was a ketch barge of 71 tons originally built in 1901, by McLearon at Harwich, with the registration number of 109881. Initially owned by S. R. Groom, and a sister ship to 'Alice May', she was later altered to a spritsail rig, and fitted with an auxiliary motor in 1949 - this first engine installation is also thought to have been a Kelvin K3 but no further information has been discovered. After 1955 she was owned and operated by R & W Paul of Ipswich and described as a 'motor barge' but little else is known until she was sold to Taylor Woodrow in 1974 to become a static exhibit at St. Katherine's Dock near London's Tower Bridge. She was sold for private preservation in 1992 and moved to Hoo Marina near Rochester - the engine was probably removed at this time. Unfortunately she was subsequently damaged by very high tides and now appears to have been abandoned. Please click here to visit the Thames Barge website. The name 'Dannebrog' derives from the Danish flag which dates from the 14th Century and is believed to be the world's oldest national flag - it is also the name traditionally given to the Danish Royal Yacht.